Raaga.com: Is Kangana Ranaut set to reinvent Nargis of MOTHER INDIA? 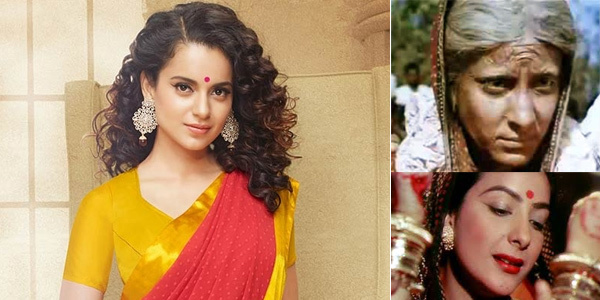 Is Kangana Ranaut set to reinvent Nargis of MOTHER INDIA? If there is one actress of contemporary cinema, who can stand up to the stature of the legendary actress of Golden Era Nargis, than she is arguably none other but Kangana Ranaut. The actress who in a small span of time has won two National Awards for QUEEN (2014) and FASHION (2008) has proved her versatility as an actress par excellence. Now it seems she has got a life time opportunity to become immortal in the annals of Indian cinema by reinventing the role of an 85 year lady, the role which great actress Nargis played with perfection in Oscar Award nominee MOTHER INDIA (1957). According to reports eminent filmmaker Shekhar Kapur has been left bewitched by Kangana Ranaut’s histrionics and has signed her to play an elder woman’s role in his forthcoming film. Kangana Ranaut who is today the number uno actress of Bollywood is known for doing roles that are different. A close look at her career reveals that she has really taken her career seriously and instead of doing run of the mill stuff she has chosen challenging roles that other actress do not dare to perform for instance her deglamorised girl role in QUEEN. Truly the role will offer immense opportunity for Kangana to display her histrionics as the legendary actress Nargis got in MOTHER INDIA. Few may know that for MOTHER INDIA’s role Nargis took rivalry with R.K. Camp (Raj Kapoor Film Company) because Raj Kapoor did not wanted Nargis to play a mother and put their romantic Jodi at risk but Nargis dared to play the mother’s role and became immortal in annals of Indian cinema. It seems it’s Kangana Ranaut’s chance to repeat history!! !